The commercial kind of made me laugh – who is this Gibbons guy and why is he so deserving of his own spot to prop up a (mid)major market team? 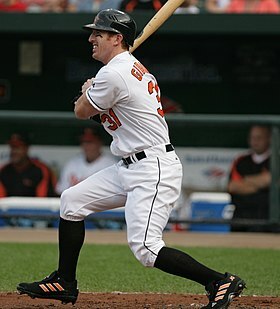 He answered with 28 dingers that season for the lowly O’s, and 23 the following year. . .but in 2007 was out of the game, perhaps blackballed for being named in the Mitchell Report. Now that he’s back on the Dodgers (replacing the woebegone Garret Anderson), Gibbons is starting to hit – and prove that he belongs in the Majors again. The following is the full text of a letter written by former Orioles outfielder Jay Gibbons to all 30 major league teams, seeking a minor league contract. Gibbons, who was named in the Mitchell report, has been without a job since Baltimore released him in March. You can find the letter here. Writing this letter is both painful and humiliating. It has been almost six weeks since my release from the Orioles and I am still unable to land any opportunity at a second chance to play the game that I love. I am young, healthy and determined. I have acknowledged and apologized for the mistake that I made and writing this letter should be proof enough that I have indeed suffered for my mistake. I have faith and hope that some team will give me the chance to prove that I can not only be a productive player but also be a stellar member of their organization. My faith in a second chance has inspired me to work harder than I have at any time in my life. My faith has gotten me through this most difficult period in my life. All I need is a chance — any chance — anywhere. I am more than willing to begin the process of proving that I can and will be a productive major league player by playing in the minor leagues. As you know, I have played seven seasons in the big leagues and have hit 20-plus homeruns in three seasons and have hit .277 in three seasons (2003, 2005 and 2006). At 31 years old, I have NO DOUBT that my best baseball is ahead of me. I know that my agents at ACES have tried to land me an opportunity in the minor leagues but have been met with negative responses by each and every Organization. I am not blind to the fact that I have made a mistake and that mistake has raised doubt about my character and ability. It is important that you know that my indiscretions, while regretful, were made in an effort to heal a nagging wrist injury. I would encourage you to speak with anyone in this game, including players, coaches, front office etc. who know me. I am confident that everyone you speak with will vouch for my character. I respectfully and humbly request that you grant me the chance to play for your organization. I am so willing to prove myself as a player, and a person, that I will donate ALL of my minor league earnings to your Club’s charity. In the event that I earn the right to play at the major league level, I will gladly donate a significant sum to that same charity. Once again, all I need is a chance and I will prove that I can be an extremely productive player and a great addition to your organization. Please feel free to contact me directly [phone numbers redacted]. Thank you for your time and consideration. Touching, and well done by Mr. Gibbons. Here’s to finishing off the season strong and looking forward to him finding a permanent home in the Big Leagues, where he belongs.